The Stitchmaster Steamaster 118T Steam Cleaner is a professional upright crease removing machine desgined to sort out any wrinkles just like your local dry cleaner. A professional grade product as used in the clothing and fashion industry. 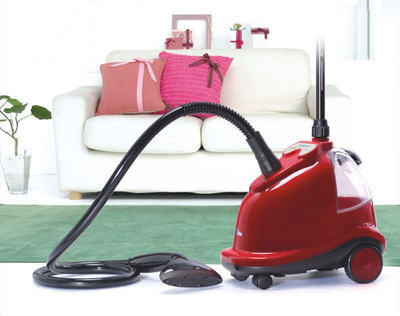 Instantly refresh and remove creases from clothing and household fabrics. Quickly and effectively removes creases and odours from items that would otherwise have to be dry cleaned like suits, jackets and trousers reducing bills and prolonging the life of the item. Simple to use, the single temperature setting is suitable for all fabrics, and is safe to use on delicate fabrics such as cashmere, chiffon and silk. These appliances are not only credited with cleaning but also with sanitizing, disinfecting and killing bacteria, dust mites and mold. Instead, most experts say the best places to use a steaming machine are bathrooms (tile, grout, shower doors, etc.) surfaces of large appliances, curtains, wood paneling and metal blinds. They shouldn't be used on painted surfaces or soft plastic. Gentle steam is perfect for use on decorative detailing, such as beading, embroidery and lacework, whilst powerful enough for heavy drape and upholstery fabrics. The vertical steam action and portable design enables drape and upholstery fabrics to be refreshed and creases removed in situ. The perfect product for professionals who are wearing smart suits, jackets and trousers to the office everyday, who want to refresh their clothes without having to make frequent visits to the dry cleaners. These appliances are not only credited with cleaning but also with sanitizing, disinfecting and killing bacteria, dust mites and mold. Instead, most experts say the best places to use a steaming machine are bathrooms (tile, grout, shower doors, etc. ), surfaces of large appliances, curtains, wood paneling and metal blinds. They shouldn't be used on painted surfaces or soft plastic. As this product has been reduced to clear, there is no warranty with this product.